Press Releases – Blue Frog Simple Solar | We bring together FINANCING, EQUIPMENT and INSTALLATION to make residential solar easy for YOU! SEATTLE — Demand for solar homes in the Washington market is at an all-time high. Builders offering a solar option on new construction find that their homes sell twice as fast as those without a renewable energy option. But not everyone understands how simple it is to finance a residential solar system – or just how fast the return on investment is with today’s incentives. Blue Frog Solar is changing that, with its new Simple Solar campaign for builders, developers and homebuyers. Blue Frog has partnered with A&R Solar, one of Washington’s top installers, and Puget Sound Cooperative Credit Union to create a complete solar financing, materials and installation package. The Simple Solar program will offer the best pricing and simplest process for installing Made in Washington solar arrays on homes. Dwell Development of Seattle is the first to offer the Simple Solar package to customers, and a promotional event for Dwell homebuyers will be held May 15 in Columbia City. The event is by invitation. The Simple Solar package takes advantage of the excellent incentives available for consumer investment in residential solar systems. The average Washington homeowner who goes solar today will enjoy $760 in energy savings annually, while state and federal incentives (including sales tax exemptions and energy buyback from utilities) have lowered the payback period to as little as five or six years. With a 30 percent federal tax credit and product incentives through 2020, a homeowner could get a $25,000 residential solar system for a net investment of just over $1,300. Along with their “1-2-3” steps to Simple Solar -– apply for zero-down financing through PSCCU, sign a contract with A&R, and set a date for solar install –- Blue Frog is also showing builders and developers how to make their homes solar-ready at the point of design and construction. Measures range from orienting homes to maximize sun exposure and leaving unobstructed roof space, to pre-wiring needed conduit and leaving breaker box space for solar equipment. While the program is focusing on new construction at launch, all Washington homeowners can take advantage of the Simple Solar package. The Blue Frog Solar website will guide anyone through the process in just a few minutes. 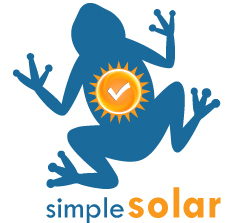 For information on the Simple Solar program, see www.bfsimplesolar.com, email simple@bluefrogsolar.com, or call (206) 855-5149. For information on Dwell Development’s participation in the Simple Solar program, see www.dwelldevelopment.net or call 206.683.7595.